The Stream Machine Water Launcher QF-2000 is a full 3 feet long and is one of our biggest workhorses! It is approximately 36 inches long. This bad boy will allow you to reach the water from the side of your boat, dock or raft with ease. 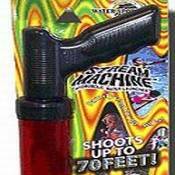 If your planning a day on the water with your family you don't want to leave this Stream Machine behind.Shoots up to 70 feet !Re-Load Faster than your water battle apponent.